Wrap yourself up (without ruining your look). This ultra-soft scarf wrap comes in on-trend color combinations and is sized to keep you warm without adding too much bulk. Ward off chills during commutes, outdoor events, or wear one just as a comfy finishing piece. Dimensions: 81" x 24" x 0.1"
I gave this product to my daughter and she loves it. The color is true. It is B-E-A-U-T-I-F-U-L, and very soft. Lovely colors. Warm and cozy. 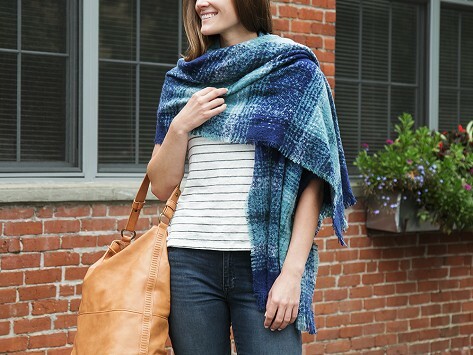 Wearing an ultra-soft plaid scarf wrap from Amanda Blu is like wrapping yourself up in a super warm—and stylish—blanket. The cozy topper is the perfect finishing piece for chilly days (or offices) and it’s sized to be comfy without adding too much bulk. Mark and Michelle Ferrel began Amanda Blu in 2004, and soon their jewelry business grew to include more women’s accessories. Their one size fits most scarves blend an on-trend look with practical warmth, which we think many women will appreciate.